Hi folks...sorry for the late post today. The busier I get, the more and more my blog seems to take a back seat. Sad, I know...but true! We had such a busy weekend and I just could not muster enough energy to write this post last night. So alas, here it is...another dessert. But so simple, and so good! I have an obsession for Nutella...it's so yummy! The other day my friend Lisa texted me telling me how she had finally bought Nutella...then, a few minutes later, she texted me to tell me she was so surprised that Nutella wasn't all that healthy for you!! I giggled out loud, and asked her why in the world she would ever think anything that ever tasted so good would be healthy? lol... Her response..."Well, because you love it and eat it so much, so I figured it had to be healthy!" Awe, Lisa, that's sweet of you to say, but contrary to what I want to believe and what everyone else thinks, I am definitely not a perfect, healthy eater! Nutella just tastes way too good to be good for you...and I can never pass up Nutella! Blend all ingedients together well. Form into 1″ balls. Place on a cookie sheet. Press down firmly with the bottom of a glass. Bake 7-8 minutes or until set. Cool. I'm not gonna lie...these aren't the prettiest cookies to look at once they are baked (mine looked nothing like the picture). But they are so yummy, so it's pretty easy to overlook how funny they ended up looking! Enjoy! p.s- I am looking for more recipe contributors starting next Monday, August 27th. If you're interested, I'd love to feature you! Contact me through my blog with your email address and I will get you on the schedule! Those sound good! 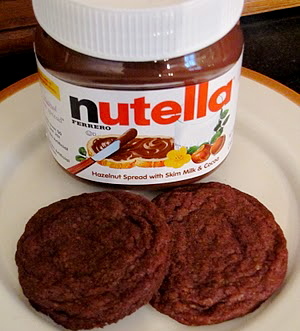 I will have to give the recipe to my sister since she loves Nutella! Nutella is made with skim milk -- it MUST be healthy. ;) Thanks for the easy recipe that feeds my addiction! Ooohh these look so delicious!!! 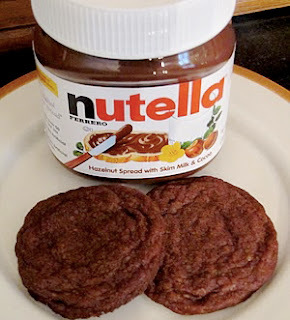 I've been wanting to make some cookies with Nutella, these look wonderful!